I have created this page to display some of my paintings of farm animals and folk art landscapes. There are some great canvas art and famous paintings by Grant Wood and Monet on display within this page. My paintings depict sheep and Highland cows mostly. This is my latest large 24 inch folk art painting. A happy seaside scene featuring a sheepdog and hot air balloons. Below are some really good paintings of farm animals by various artists. 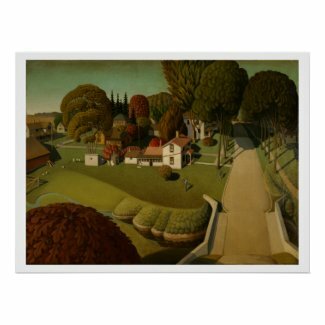 Grant Wood was a famous artist from the United States who painting rural landscapes and the American Midwest farms and animals.